In a paper published today in the journal Nature, the ALPHA collaboration reports the first ever measurement on the optical spectrum of an antimatter atom. This achievement features technological developments that open up a completely new era in high-precision antimatter research. It is the result of over 20 years of work by the CERN antimatter community. "Using a laser to observe a transition in antihydrogen and comparing it to hydrogen to see if they obey the same laws of physics has always been a key goal of antimatter research," said Jeffrey Hangst, Spokesperson of the ALPHA collaboration. Atoms consist of electrons orbiting a nucleus. When the electrons move from one orbit to another they absorb or emit light at specific wavelengths, forming the atom's spectrum. Each element has a unique spectrum. As a result, spectroscopy is a commonly used tool in many areas of physics, astronomy and chemistry. It helps to characterise atoms and molecules and their internal states. For example, in astrophysics, analysing the light spectrum of remote stars allows scientists to determine their composition. With its single proton and single electron, hydrogen is the most abundant, simple and well-understood atom in the Universe. Its spectrum has been measured to very high precision. Antihydrogen atoms, on the other hand are poorly understood. Because the universe appears to consist entirely of matter, the constituents of antihydrogen atoms – antiprotons and positrons – have to be produced and assembled into atoms before the antihydrogen spectrum can be measured. It's a painstaking process, but well worth the effort since any measurable difference between the spectra of hydrogen and antihydrogen would break basic principles of physics and possibly help understand the puzzle of the matter-antimatter imbalance in the universe. Today's ALPHA result is the first observation of a spectral line in an antihydrogen atom, allowing the light spectrum of matter and antimatter to be compared for the first time. Within experimental limits, the result shows no difference compared to the equivalent spectral line in hydrogen. This is consistent with the Standard Model of particle physics, the theory that best describes particles and the forces at work between them, which predicts that hydrogen and antihydrogen should have identical spectroscopic characteristics. The ALPHA collaboration expects to improve the precision of its measurements in the future. Measuring the antihydrogen spectrum with high-precision offers an extraordinary new tool to test whether matter behaves differently from antimatter and thus to further test the robustness of the Standard Model. ALPHA is a unique experiment at CERN's Antiproton Decelerator facility, able to produce antihydrogen atoms and hold them in a specially-designed magnetic trap, manipulating antiatoms a few at a time. Trapping antihydrogen atoms allows them to be studied using lasers or other radiation sources. "Moving and trapping antiprotons or positrons is easy because they are charged particles," said Hangst. "But when you combine the two you get neutral antihydrogen, which is far more difficult to trap, so we have designed a very special magnetic trap that relies on the fact that antihydrogen is a little bit magnetic." Antihydrogen is made by mixing plasmas of about 90,000 antiprotons from the Antiproton Decelerator with positrons, resulting in the production of about 25,000 antihydrogen atoms per attempt. Antihydrogen atoms can be trapped if they are moving slowly enough when they are created. Using a new technique in which the collaboration stacks anti-atoms resulting from two successive mixing cycles, it is possible to trap on average 14 anti-atoms per trial, compared to just 1.2 with earlier methods. By illuminating the trapped atoms with a laser beam at a precisely tuned frequency, scientists can observe the interaction of the beam with the internal states of antihydrogen. The measurement was done by observing the so-called 1S-2S transition. The 2S state in atomic hydrogen is long-lived, leading to a narrow natural line width, so it is particularly suitable for precision measurement. The current result, along with recent limits on the ratio of the antiproton-electron mass established by the ASACUSA collaboration, and antiproton charge-to-mass ratio determined by the BASE collaboration, demonstrate that tests of fundamental symmetries with antimatter at CERN are maturing rapidly. That seems an odd phrase. I don't think there is anything "so-called" about that transition, is there? Oh, . . I was hoping for something exotic and exciting, such as "negative energy". And apparently unless you subscribe to Nature magazine the "result" is either totally secret or not worth including within this waffle rich article. ...the "result" is either totally secret or not worth including within this waffle rich article. "Within experimental limits, the result shows no difference compared to the equivalent spectral line in hydrogen." That's the substance of what was sought. Next: Does antimatter fall... up? Well, the result re-entails the mystery "If antimatter is so mundane, why isn't there as much of it around the universe as everything else?" My question is - how do we know which we are looking at then? Only ‾H is put in the trap. Dark energy seems to have an inverse effect than "normal" energy. How do you know this? I've never seen a SPECTROSCOPY for DE. If it's ENERGY there is SPECTROSCOPY from which we can evaluate how it is inversely different from "normal" energy. Part of my Job Description is the oversight of our company's Gamma Ray Spectroscopy Lab, so don't worry about the small details for what you don't understand, I'll be able to fill it in. @Benni This is not about spectrography, or at least the differences in this aspect are still to be seen. But one thing seems to be clear . Energy does compress space creating gravity. While dark energy expand it creating antigravity . They are inverted in this aspect. But it is speculation as I said, but if charge has an inverse field , why not gravity? It seems very possible. Regarding radiation, dark energy has not been detected with any of your instruments, so if it exists it must be also different in this aspect . In space, how would we know which is which, if their spectral signatures are the same? Careful. Benni... There is spectrographic info only if there is light (photons, em) emitted in our direction. Oversight? You mean - MANAGEMENT...?!?!? Yep that's the result- I missed it by speed reading past all the waffle. 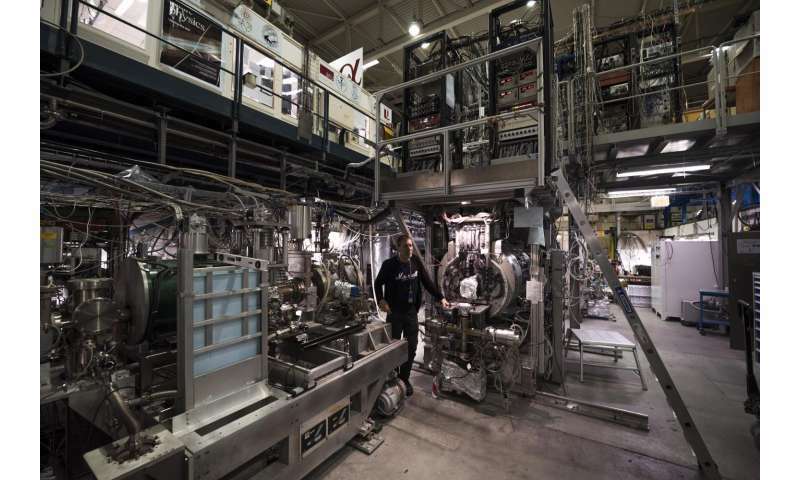 Well done guys at CERN: creating and holding enough antimatter to run the tests on! Any chance of creating any anti-neutrons to see if they exist and weak decay works the same? Good question, I don't think there is a way. That brings up the question, why is it assumed the universe is almost entirely made up of matter? But it begs the question if antimatter only comes in proton electron size. Or are there other configurations just like matter. Nope. Just not down as fast as normal matter. Will get into that talking about baryogenesis very soon. I think there is but will be discussing that in barygenesis. OK, I was trying to figure what this INVERSION was about, now it's clearer as to the point you were making. I do look at energy & gravity as being tangentially related to one another, after all they travel at the same velocity. Beyond velocity, I have serious doubts that we'll ever discern how the two entwine with one another. We know photons are not massless, but how gravity waves entwine with EM waves will probably forever remain a mystery. Energy does compress space creating gravity. While dark energy expand it creating antigravity . I think they're both the same thing. In baryogenesis the density of antimatter was less than the average energy density of the dark energy. Hence it was squeezed out and fortunately most of it is still out there - way out there. Antigravity. Matter was of course squeezed in by the expanding spacetime. In the end times the energy density of antimatter will be greater than the forces of expansion, (I presume) at which time antimatter will also be squeezed in like matter and when the two start to mix it's going to be quite a show. Anyway the gravitational force of antimatter will be less than that of matter, or so it seems, and it may be extremely difficult to find the difference. Anyway I'm assuming antimatter is made of negative energy. But that is only negative re the energy density during baryogenesis. When particle and antiparticle are annihilated the resultant energy density is the average dark energy density when the pair was formed. Much different from 0. Now when creating particle-antiparticle pairs you have to simulate the energy density during baryogenesis. Does happen when lightning strikes apparently or any other source of concentrated energy density. Well yes but - another pet theory. The compressive force works from inside spacetime, not outside. The result is the expansion of spacetime. Matter and antimatter don't expand because their energy is quantized. Therefore they are being squeezed out - matter more strongly than antimatter, fortunately. It's fairly obvious if you think about it. Space is filled with hydrogen. If it were made of mixed hydrogen and antihydrogen, we'd be able to see it annihilating everywhere. We don't. If there were regions filled with hydrogen and others filled with antihydrogen, we'd be able to see annihilation at the edges of these regions where they come into contact. We don't. Galaxies are made of matter; if they weren't, we'd be able to see annihilation at the edges of galaxies of antimatter in contact with the hydrogen in the intergalactic medium. We don't. So the answer is, if there were antimatter out there, we'd be able to see it, and we don't. More on baryogenesis - antimatter is squeezed out as long as it's energy density is less than that of the dark energy. It shouldn't take that long though considering the size of the U during baryogenesis. Now it's going to take it longer to return because now the size of the U is much greater and the compressive force is much less due to expansion of the DE. There is an antiparticle for every particle; all the quarks, all the leptons, and all the weak and strong (gluon) particles have antiparticles. Technically photons are their own antiparticles (and gravitons, though since we've never seen any, we can't actually state that as a fact). So there are antiprotons made of antiquarks and antigluons, and so forth. If there were regions filled with hydrogen and others filled with antihydrogen, we'd be able to see annihilation at the edges of these regions where they come into contact. We don't. Not yet anyway. There's some question about the lower energy density of antimatter actually enhancing the expansion in the early U. This expansion would be from the edges of spacetime, not the interior. ..how gravity waves entwine with EM waves will probably forever remain a mystery. ......and the same for Dark Matter. I wouldn't know about that, but what I do know is that because electro-magnetic waves are transformed mass, that means the particle mass from which it was transformed now inherently carries the gravity field once associated with the particle mass before it was transformed, this is measureable & calculable. EM waves are not "transformed" mass. A mass particle is an EM wave confined in a small space. EM waves and mass are the same thing, just kinetic energy. Either confined or in free move. But how kinetic energy manages to warp spacetime is the real mistery to me. We know the effect, we can measure it and we can predict it with Einstein formulas. But we do not know the cause. Why energy warps spacetime? There are anti-matter partners for all particles and you can indeed make anti-matter equivalents of any element or molecule for that (anti)matter. Forgive my stupid question but do we need fusion to make the antihelium to test its spectra? Are we going to be left waiting on the energy industry before we can progress further through the Periodic Table of Anti-elements? Im sure we could spend decades studying just antihydrogen but this result makes me "curiouser and curiouser." Of course the fact that we don't observe any antimatter galaxies would inidcate otherwise - or that there is some other mechanism why they were created in asymmetrical amounts to start with. This question is very much at the heart of researcher's interests. EM waves are not "transformed" mass. Einstein never drew any distinction between MASS & ENERGY, so I'd say you are at least substantially correct in this regard. But we do not know the cause. Why energy warps spacetime? It's simply the inherent gravitational attraction that follows with EM upon transformation from Particle Mass. Mass is Newton's constant! His question; however, was "What is inside mass that produces such a field?" Atomic physics came later. Anyway the field, ie. the visible and reaction of groups of Diametrical Spherical Fields, apparently never created or destroyed. What we see are the wrinkles in the field of one of these that exist from its center to infinity. Conglomerations are simply n equations with n unknowns. I would start small, say with what holds the nucleus together? Maybe an answer to a set of these without gluons or GR, since none of these define mass! How about an axiom: Diametrical Spherical Fields are all that exist! Let's call it DSF Theory! The field is updated relative to its center at the speed of light, any observer will observe a speed of the emitted Wavelength by the measured Period not a constant! But it's easier when one sees that these fields are superimposed and reflect the consequential charge motion! So it's nice to drop a ply onto another with proper initial conditions. The reality of the drop is our simulation, keep it real! Or settle for where it stabilizes or destabilizes. Most will stabilize but it gets complicated, contained volume, system stability? So the transformed mass energy is the internal energy of the particle. So if you think about it the internal energy corresponds to something (like a Higgs boson) traveling at the speed of light back and forth (perhaps hence the factor of 2) trapped inside a quantized space. Point is this space occupied by the particle is not easily stretched or compressed like space itself. Hence when space expands the particle (or antiparticle) gets the squeeze. Hence gravity. I think energy distorts or displaces the expansion of spacetime. Very counter-intuitive because you'd think energy causes the expansion of spacetime. But not kinetic energy - dark energy. Kinetic energy displaces the dark energy causing an uneven distribution of expansion and energy distribution and hence warping. So gravity actually comes from the dark energy come to think about it. I do look at energy & gravity as being tangentially related to one another, after all they travel at the same velocity. You could say the gradient of spacetime expansion moves around with matter and other naturally occurring gradients such as one form of dark matter. Naturally occurring gradients appear as non-uniformities in the cosmic microwave background. It's amazing that these gradients are as small as they are after the turbulence caused by the big bang. And this smoothing-out occurred because the U was very small and energy could be mixed around from one end of the U to another in a very short period of time. Anyway the force of gravity exists as a state of non-uniformity of the DE. It's there waiting on you when you get there so its effective velocity is instantaneous. Now gravitational waves are something else - like shock waves propagated through spacetime at the speed of light, which you might call gravitons. Energy does compress space creating gravity. While dark energy expand it creating antigravity . You'd think expanding the space between you and me would be creating antigravity. Maybe so. But together we're displacing the DE so the expansion between us is less than that around us. That means we're getting the squeeze and experiencing a net gravitational attraction. Strange I know. There are no particles, empty space is only conceptual, each charge exists from it's center to infinity! It is a member of a diametrical set of these, apparently occupying an infinite space with an infinite number of these. Large collections of plasma crushed together due to a calculable number of pairs as a superimposed collective point for each polarity! Is it the stationary state or the distance between events, never mine choose that as a measurable constant or a variable as a function of the number of pairs? But I rather study what is in front of me as my basis. The rest can be simulated! We are nature's complexity! We take for granted, let imagination defy common sense. It's right there in Maxwell's collection and derivative work. With close inspection, experience as an MSEE, you see the Axiomatic Structure Logic so requires! I'm just playing with the blocks and watching others carve their blocks to fit these logically place holes! ......there are those who think particles function as the perfect mirror box, with trapped photons inside the box looking for a way out, then when something cracks the shell of the particle the once trapped photons are released. I understand this concept of the mirror box when it comes to Einstein's Mass/Energy Equivalence Principle, but this concept negates an actual TRANSFORMATION of MASS from one state to another, it must be the entire particle that TRANSFORMS. trapped inside a quantized space. Point is this space occupied by the particle is not easily stretched or compressed like space itself. Hence when space expands the particle (or antiparticle) gets the squeeze. Hence gravity. Gravity is MASS dependent, the only effects of it is the Inverse Square Law. It's gotten so bad that an understood axiomatic structure refers to no structure! Within this systemic Nobel structure a simple criticism does not a paper make. To define a proper paper requires the entire rewrite of Modern Physics and proper logical structure of any Theory,. It would be beautiful as a basis using the axiomatic structure of DSF theory with computational availability to all. The idea, offer this Nobel as a computational proof of anything. I expect intelligent tech to try to take advantage of this as a digital model; however, I expect method, controls, insights, will be limited by the size of the audience. Examination by peer review propagates what? ...........Consensus Science, although I would use the word "Science" in a very loose manner. Maybe just drop the word "Science" if the peer review is not about a topic in science. If the "peer review" is about a topic in Journalism, than it would be tag-lined as "consensus journalism". Does anti-matter exist? No, an inspection of the cloud chamber where anti-matter was first expressed only showed a positive charge moving within the field as opposite to the negative. No annihilation events. The annihilation events are probable seeing a proton acting like an electron or an electron acting like a proton. The Dirac prediction is based upon QM. QM is non-causal. Not only cannot predict causality, it cannot define anything. It only satisfies a wave equation for potential energy and kinetic energy based upon giving a name to events, and pictures of the results, no causality! If the spherical field exist from its center to infinity then it and its anti-particle are all that exist. But these are not particles! Hence the necessity of anti-matter is only a dream of some sort of imagined symmetry and balance not based upon reality. ,,, uh, yeah. An inspection of any PET scanner at the local hospital will show you peoples using antimatters.. The annihilation events are probable seeing a proton acting like an electron or an electron acting like a proton. Well that is a really good theory, except for one little problem, it's a little one so it might not matter (yeah, that's is the Cajun pun, matter, get it?) The electron or positron is 1800 times less massive than the proton or antiproton. It would be really hard to overlook that. I wouldn't know about that, but what I do know is that because electro-magnetic waves are transformed mass, that means the particle mass from which it was transformed now inherently carries the gravity field once associated with the particle mass before it was transformed, this is measurable & calculable. Actually, I intuitively agree with this. It suggests the gravitational field of the particle is now spread over the entire path(s) of the EM wave... ? ...Technically photons are their own antiparticles (and gravitons, though since we've never seen any, we can't actually state that as a fact). Not sure about that. Seems that they could be the carriers of gravitational waves found by LIGO. Technically photons are their own antiparticles (and gravitons, though since we've never seen any, we can't actually state that as a fact). In the Photon Deflection section of General Relativity, Einstein calculated the actual deflection (gravitational lensing effect) of a photon as it passes the immediate peripheral disc of the Sun. He calculated it at 1,75 arcseconds in 1915 within 0.02% of error as measured by today's best measurement standards. The above point being that if something is truly MASSLESS, gravity can have no effect on it, no Photon Deflection. Because in Nuclear Physics we can prove by TESTABLE data that energy is conserved upon TRANSFORMATION, then nothing is lost to the system, including gravity which by necessity is carried within the EM Wave. Nuclear Physicists can MEASURE & CALCULATE gravity fields of Electro-magnetism. Pishposh. Using actual observables to make an argument. How dare you, Ira. Not with this: E = hv........Biologists trying to be Nuclear Physicists. Is the mass of a neutron anywhere equal to the mass of a proton+electron? And does neutron mass vary from nucleon to nucleon? .......but of course after awhile you become accustomed to the Stump's predilection for endeavors in pseudo-science. Management. As in, "not doing science". Surprise. .....and hey there jimbo, if you were so astute in "science" you would have pointed out what the problem was with the biologist's post long before I did. No, you didn't just give it a friendly overlook, the novice you are you simply didn't recognize it........probably still don't do you? Mass? I thought we went from Newton to Maxwell and skipped over Logic! 1) I'm an electrical engineer (and a PhD in human biology) - not a biologist. 2) I work for a company that makes PET scanners. Yeah. They know how to make this stuff work. This aint' rocket science. That's basic prep course physics in any engineering degree (in most countries you do stuff like this in highschool for chrissakes). Ya know: If you didn't do it before then this is the final nail in the coffin that you never touched a physics (let alone engineering) book in your life. Found it. Neutrino decays to proton, electron and neutrino..
......Hey, hey, a tad touchy there Mr Biologist. I've just always noticed how very good you are in the biology stuff & how miserable you are in matters of technical discussion such as being discussed here. Hell's bells bioguy, you couldn't even explain the application a simple equation that you misapplied, you're just mad because I caught you again for the umpteenth time & you needed an artist to supply an excuse for bailing you out of the corner you backed yourself into. He didn't apply it, he just stated it as one of 2 factors required. you're just mad because I caught you again for the umpteenth time & you needed an artist to supply an excuse for bailing you out of the corner you backed yourself into. Why are we still playing with imaginative science while ignoring the obvious Logic and empirical physics? Mass has never been a unit of matter! It's a freaking mathematical constant! Plus, this measure seems to being trouble with validity, i.e. gravity, i.e. circular logic! Anti-matter? What is matter? Apparently it is a set of diametrical spherical fields! Axiomatic definition of charge! What are the calculable steady states for each element, neutron as supposition of a pair. n centers, n equations, n unknowns. Energy states, plasma, streams of any combo, circular motion, what are we talking about? Anti-matter? WTFIT? Would make you a natural for robotics. Well, one company I worked at was developing robotics for spine surgery (setting screws). Sadly had to stop development after finding out that it is next to impossible to get a robot cleared for medical applications if you don't have some tens of millions of euros lying about. Hey, hey, a tad touchy there Mr Biologist. I dunno Mr. janitor. What's your point? Now that we know you have been lying about being an engineer: What's left for you? Merry Christmas to all of you, who stop these posts from being boring. Common Fusion power is still >20 years away. The point being that you need to actually understand the math behind the subject material that was under discussion. Instead you stumbled & bumbled your misapplication of equations you didn't understand. Then, instead of admitting your screwup, you tried to FAKE your way through it. Material like this is far beyond your skillsets, give it up, stick to Biology & Story telling for which there's no need for you to try your dismal incoherent math skills. Many? You couldn't find even one. This I gotta see. Supply a cite to back that up. Please. Do. ........high school physics for me, but impossible for you at any level. Erm, are you mental? Look it up. The way I stated it is exactly how it works. Planck constant times frequency gives you the energy of the resulting gammas. The energy of that can be used to calculate the original masses via E = mc^2. ........I see you're still working on it Mr Biology guy. We can detect individual photons; our instrumentation isn't sensitive enough-- by orders of magnitude-- to detect individual gravitons. Gravity is the weakest force at the field therory and quantum theory level. The gravitational constant is 6.674×10^−11 N⋅m2/kg2; for comparison, the equivalent constant for electromagnetism, Coulomb's Constant, is 8.99×10^9 N m2 C^−2, twenty orders of magnitude larger. Gravity is so weak that we can't detect the corrections for it in the Standard Model. The only reason that it's so powerful at the level of planets, stars, galaxies, and above is that unlike all the other three forces, it has no opposite, so over the large scale it just keeps building up. Naively, one could conclude that a neutron is proton + electron, and this even seems to be bolstered by neutron decay into a proton and an electron, called beta decay. But the proton mass is 1836x the electron mass, and the neutron mass is 1838.7x the electron mass. This presents a missing mass problem. Worse yet, all three particles have spin +/-1/2, and there is no way to add a spin +/-1/2 proton and a spin +/-1/2 electron to get a spin +/-1/2 neutron. In 1956, the neutrino was detected, adding a third spin +/-1/2 particle to the neutron decay and balancing the books on spin. Eventually we worked out that a neutron decays into a proton by emitting a W- particle, of spin +/-1; then the W- decays into an electron and neutrino each of spin +/-1/2. The proton and W- particles can take up all of the mass/energy of the neutron so they don't emerge with much if any velocity; but the electron and neutrino cannot take up the energy of the W-, so they both emerge with significant velocities. Thus, when a neutron decays, a proton is left pretty much where the neutron was, and an electron and an antineutrino convert the extra mass/energy of the W- particle into kinetic energy and leave the scene of the decay. The key tip-off to the existence of the neutrino was the fact that the electron doesn't always leave with the same kinetic energy; either some other particle was taking a random amount of energy or mass-energy conservation was being violated. When the neutrino was actually detected, mass-energy conservation was shown to be preserved. This meant that two different conservation laws (mass-energy and spin) were preserved, so the neutrino was accepted. As a side note to the above posts, two other conservation laws were also shown to exist by the detection of the neutrino; baryon number (eventually reduced to quark number), and lepton number. Baryon number: 1 baryon (proton) + 0 baryons (W- particle, eventually two leptons) = 1 baryon (neutron). The proton and neutron were eventually decomposed to 3 quarks each (proton = uud, neutron = udd), but the number conservation law still holds after that as you can see by substitution into the first equation. Lepton number: 0 leptons (proton) + (1 lepton + -1 lepton (electron and antineutrino) = 0 leptons) = 0 leptons (neutron). It turned out that weak interactions could not only turn leptons into other leptons, and quarks into other quarks, but that they could also create lepton/antilepton pairs when they turned quarks into other quarks. The essential point here is these conservation laws. They are the most important laws of nature. Heh, merry Festivus and a happy New Year to you as well. Speaking as one of those godless atheists. I actually look on Christmas as a celebration of the birth of the first really effective revolutionary in Western history. After all, the fire Jeshua, son of a lowly carpenter, lit eventually took over the greatest Western power of the time: Rome. It has continued to the present day, albeit after taking on the attributes of the power structure it most despised. That is, of course, the eventual fate of all revolutions. You've got it backwards: in the context of the article we are commenting on, mass is not the key, energy is the key. Mass is just one type of energy. Energy has entropy, and it is the entropy that causes gravitational as well as inertial mass, EM energy, weak and strong nuclear energy, rotational energy, potential energy, and all the other forms we observe. Verlinde may be onto something. I suspect his ideas do not preclude gravitons. Instead they explain them, along with the rest of the bosons. Bring particle and antiparticle together and they annihilate and make gamma rays. If you watch long enough, any interaction that is not forbidden is mandatory. Nucleus? Your "mass" measurements are wrong! First, mass is not a fundamental unit of charge. Never has been. The charge has a field that reaches from its center to infinity and is transparent. The motion of the center is due to the field. The field we see is only ripples in the field. The fields are always present and additive by supposition. Measuring a body's relative acceleration based upon nothing but initial conditions of all centers under inspection will define the motion of the body within the existing fields, nearby bodies have greater effect. Call your events in QM or gravity or whatever, it all depends upon these, charge! DSF Theory, already in existence, Maxwell! improperly applied on the atomic level with the mis-conceptions of QM. ......No Schneibo, this is not true. "Mass" & "energy" are TRANSFORMED products of one another in Special Relativity, but of course you may be doing an RNP & falling back on the new field of physics that is coming to be known as Inferred Physics. Yeah schneibo, this new field of Inferred Physics is fun stuff. You simply coin a catchphrase for anything you want & insist a respondent state a case for it not being false. You & ap have the same problem. So take your catchphrase I lead this off with, & Copy & Paste the section of Special Relativity in which it's found. I advise no one here to hold their breath waiting for you, it'll be the last they ever take. No, Benni. They are just different stages of energy entropic path. It's a matter of "entanglement" density. (Which, BTW, takes additional energy to arrange...:-) Thereby adding to energy already collected in a given locality). Hope ya'll enjoyed a Merry Christmas or a Frollicking Fun Festivus (like the rest of us)! Lenni doesn't know what the stress-energy tensor means. This makes anything it says about relativity meaningless. A loose rubber band makes less gravity than one that's wound up. A compressed spring makes more gravity than a relaxed one. That's what the stress-energy tensor says, Lenni. It also says mass and energy are equivalent. They can be interconverted. You know, the gamma rays and the particle-antiparticle pairs. Just like that. What supports this? How does it originated from your axioms? Or is it intellectual nonsense? The gamma rays are due to fast moving electrons about the proton and fast moving protons about the electron. You do know that all radiation and rays are due to charge motion?